After much fuss, the widely hated CPE law has been repealed. I have to say, I'm a little surprised that it was withdrawn at this point, after it actually became a law. I figured that if it went into effect, that would be the end. (Not the end of the strikes, but the end of the government's action directly regarding that particular piece of legislation.) I assumed there would be another law that superceded it, rather than seeing it withdrawn all together. So, mark a victory for la jeunesse on this issue. All that remains to be seen, from my perspective, is whether de Villepin will lose his job. By the way, please observe a moment of reverent silence for Annie, who must now go back to work. Sorry, Annie! 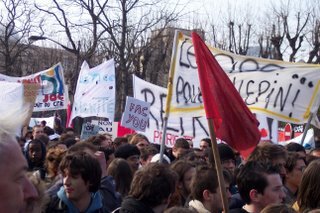 Grève off. Other than this monumental event, this was a quiet day for us. Colin went to the library early and I did my normal Monday chores (cleaning house, grocery shopping, etc.) Rachel and I are meeting for lunch tomorrow, possibly with Maggie, and if the weather is good, we'll head up to the cemetery at Montmartre afterward. I haven't been to this one yet, so it should be interesting to see how it compares to the others. ps If you ever wondered what our landlord does (which I'm sure you didn't), check out this recent posting on Superfrenchie's blog. Steven L. Kaplan owns our apartment! We're so proud. Hello! My comment has nothing to do with today's post. Obviously you don't know me, but I just spent the past week reading your entire blog from beginning to end and I almost feel as if I know you...LOL. My name is Jan and I live in Kenosha WI (originally from Chicago). I'm a 41-year-old married mother of four and also the "property" of two great dogs. I've recently developed an interest in my French roots (my great-grandfather was born in Lorraine) and I came across your site on a web search. I wanted to thank you for the entertaining insight and for making me feel as if I was there myself...hopefully I will be one day. I've enjoyed your sense of humor and your honesty, and combined with your photos, videos, and info - you've put together a great blogsite. Keep up the good work - I'll continue to follow. Best of luck, lots of laughs, and have a safe trip home! I thought about approaching the topic of these protests on my own blog, but it makes more sense just to leave a comment here for discussion. It made me glad to see a government listen to a select group of its people when they are unhappy with something. As everyone that keeps up on the news probably knows, there have been a lot of protests in the US lately about the stricter immigration laws. Many of them have been very large (and peaceful), but the government will most likely not take the protests into account. I am not saying that I agree with the protesters, but if this many people are unhappy why wouldn't the government at least forestall legislation and listen to them? Do protests really work in the US? We hear about large rallys all the time, but we rarely hear about them having an affect on how business is conducted at the "top." Would it be more effective if all immigrants (and their supporters) went on strike? One thing in response to Joe's comment. The protests were not representative of a "select group" (as CNN, at least, seems to be asserting). During the last three weeks of the protests, the opinion polls here in France were consistently showing about 70% of the French were against the CPE. In other words, this was the democratic process in action--a majority spoke (a minority of that majority spoke REALLY loudly in the streets) and the governmental representatives listened to the people. Thanks Colin for clearing that up. I haven't heard much about the protests on Slate.com or NPR, which leaves CNN as my source of news on what is happening in France. And as an addendum to my previous post, Republican lawmakers have backed off slightly since the US protests have been going on.